Colombia's rich biodiversity includes hundreds of endemic species of amphibians, some of which are looked at in this article. The South American nation of Colombia, located along the continent's northern tip, is a country that is known for its high altitude mountains, coffee plantations, and luscious rain-forests, as well as the horrific violence of the more than half of a century of civil war that has plagued the country. This country has a very rich biodiversity and it is home to a number of native amphibians species. The physical characteristics, habitats and ranges and the current status and conservation efforts will be discussed in detail for a few of these native amphibians. The Bogota Stubfoot Toad, scientific name Atelopus subornatus, is a true toad that is a member of the true toad Family Bufonidae. This species has comparatively short legs to other toads and its back and sides are covered in warts. The species backside can vary in color from a light brown to a dark reddish brown. The belly of the frog is a red or black brownish color with white and orange spots for males, while females have yellow, red or orange spots. The average male adult grows to be around 1.1 inches (28 millimeters), while adult females are slightly bigger at 1.5 inches (38 millimeters). This species is found in the tropical and subtropical montane forests of Colombia, with their bedding and larval development taking place in the freshwater streams and rivers in the area. This species is endemic to Colombia and is only found in two localities in the Colombian Andes, Fusagasuga in the Cundinamarca Department and Alto San Miguel and Aguadita in the municipality of Sibaté. The Bogota Stubfoot Toad has been listed as being a critically endangered species on the International Union for the Conservation of Nature (IUCN) Red List since 2004. The major threats that the species faces are from habitat loss due to agricultural expansion into is natural habitat and from water pollution that is from the run-off from farms near the area. The species is also likely to be affected by chytridiomycosis, an infectious disease caused by the chytrid fungus that has occurred in other Atelopus species and can have a 100% mortality rate in some amphibian populations. The Magdalena Giant Glass Frog, scientific name Ikakogi tayrona, is a species of glass frog that is part of the Centrolenidae Family of glass frogs. This species is unique in that it is the only member of the genus Ikakogi and the only glass frog species to show maternal care. The adult males and female of the species are basically the same size, 1.11 to 1.21 inches in length (28.2 to 30.6 millimeters), with female generally being just slightly larger. The species has a large head with a wide snout and is pale green to green in color with a granular dorsal skin and the males having a huge humeral spine. This species habitat is in the sub-Andean and cloud forests near natural water in only two locations in the Sierra Nevada de Santa Marta mountain range in the Magdalena Department. This species is endemic to the country of Colombia. The Magdalena Giant Glass Frog has been listed as being a vulnerable species on the IUCN Red List since 2004. The major threat that the species faces are from habitat loss and water pollution due to agriculture coming into the area. The Pandi Mushroom-Tongue Salamander, scientific name Bolitoglossa pandi, is a species of salamander that is a member of the Plethodontidae Family of lungless salamanders. Adult in the species are generally around 1.96 inches (5 centimeters) in length. They have a short tail and their upper side is a reddish grey color with a hint of blue, while their under side is is noted form having large cream-colored spots. This species habitat is in the low vegetation of the subtropical and tropical montane forests in the riverine areas of the eastern Andes at around 1,300 meters (4,265 feet) above sea level. This species is endemic to Colombia and is only found in the department of Cundinamarca, in the Municipality of Pandi. 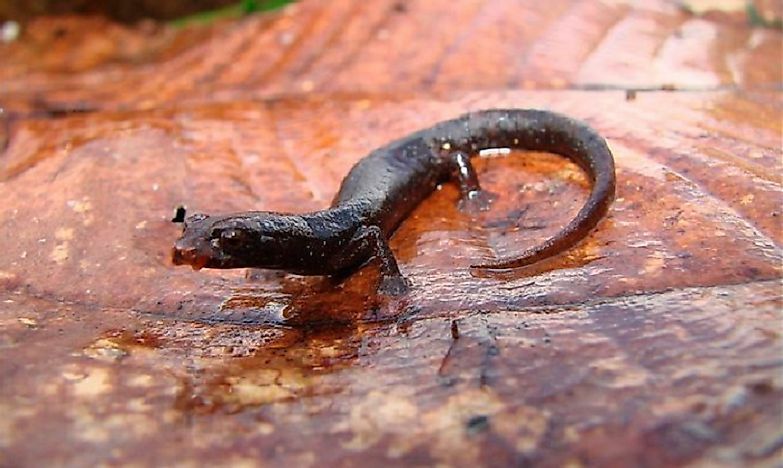 The Pandi Mushroom-Tongue Salamander has been listed as being a endangered species on the IUCN Red List since 2004. The major threats that this species faces are the degradation and destruction of its habitat from agriculture and that its habitat is become extremely fragmented. The San Lorenzo Harlequin Frog, scientific name Atelopus nahumae, is a species of toad that is a member of the true toad Family Bufonidae. Not much is known about this species as scientists when 14 years without having seen the species before 2006, until they were found in the El Dorado Nature Reserve. The species is known to come in colors from dark brown to a brownish yellow. This species habitat is in the sub-Andean forests, closed canopy secondary forests and in riparian forests near creeks. This species is endemic to Colombia and is only found in on the southeast slopes of the Cuchilla de San Lorenzo mountain, the northwest area where the Sierra Nevada de Santa Marta National Natural Park and the El Dorado Nature Reserve meet, a area by the city of Nabusimake in the department of Cesar and in the Rio Ranchería watershed. The San Lorenzo Harlequin Frog has been listed as being a endangered species on the IUCN Red List since 2014. The major threats that this species faces are from habitat loss due to logging and from illegal agriculture in the area and the pollution from it. These species also has the potential to be threatened by chytridiomycosis, although it has not yet been detected among the species in protected areas. There are a number of actions that can be taken to help the native amphibians in Colombia, especially the endangered ones. Looking into international organizations whose goal it is to help endangered frog species around the world is a start, to become more educated on the issues, see what volunteer work could be done and maybe donate money to the cause. People in Colombia and worldwide can also try and push the government their to support more nature reserves and national parks, and to crack down on illegal forestry and farming practices.